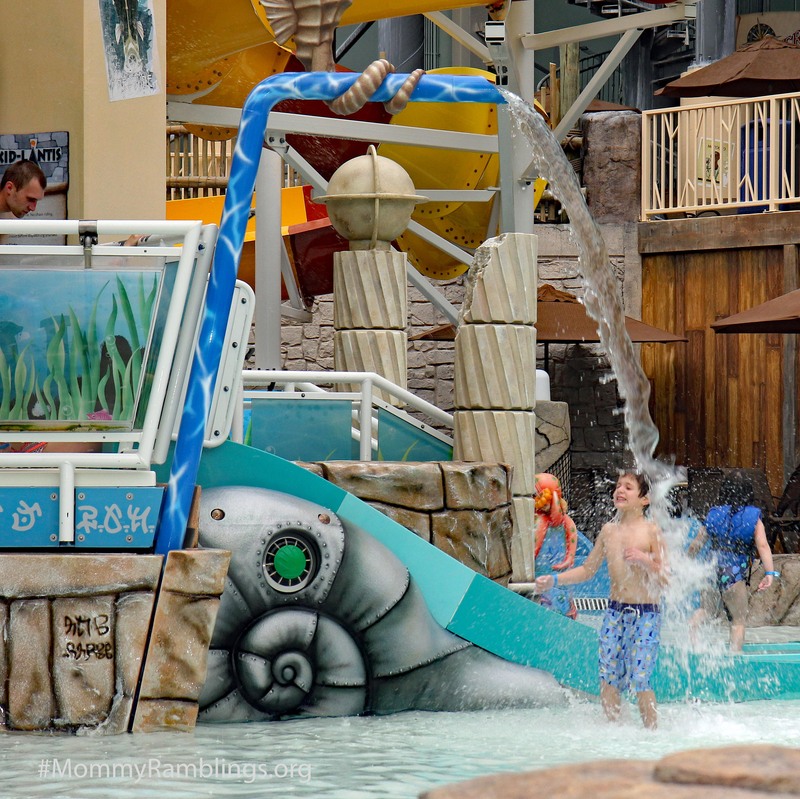 Review by Carolyn Kavarnos | Discover Aquatopia-The Largest Indoor Waterpark in the Northeast! 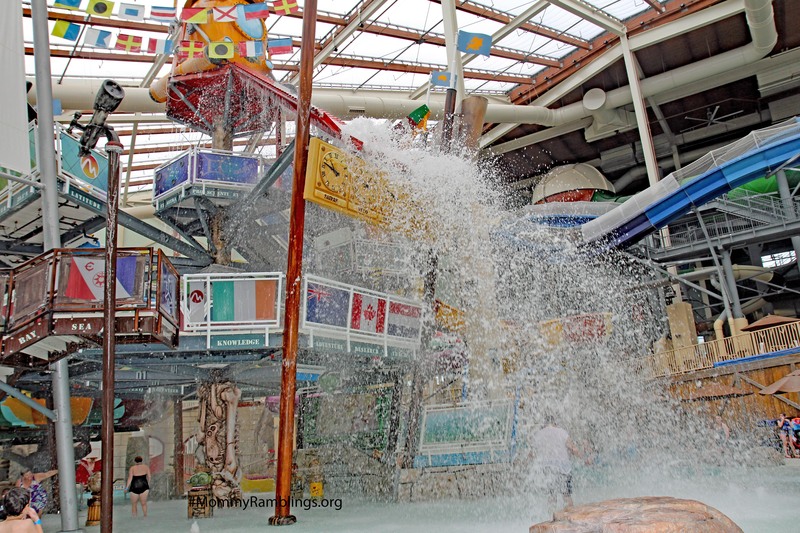 Discover Aquatopia-The Largest Indoor Waterpark in the Northeast! 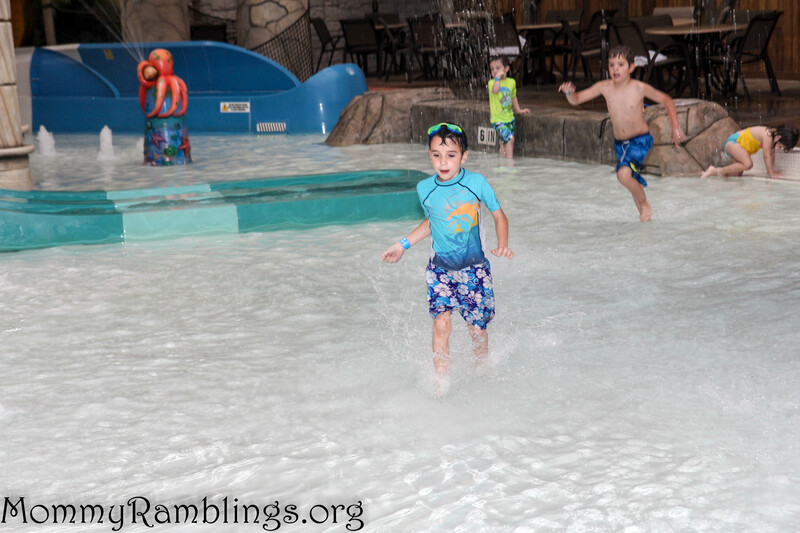 If you live in the northeast or will be visiting soon and are looking for family fun destinations, we have you covered! 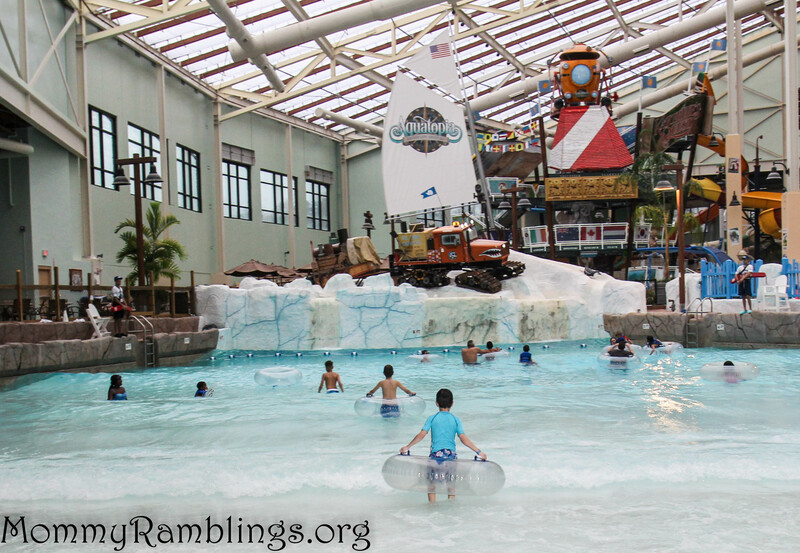 Camelback Resort Lodge and Aquatopia Indoor Waterpark is located in Tannersville, Pennsylvania in the picturesque Pocono Mountains. 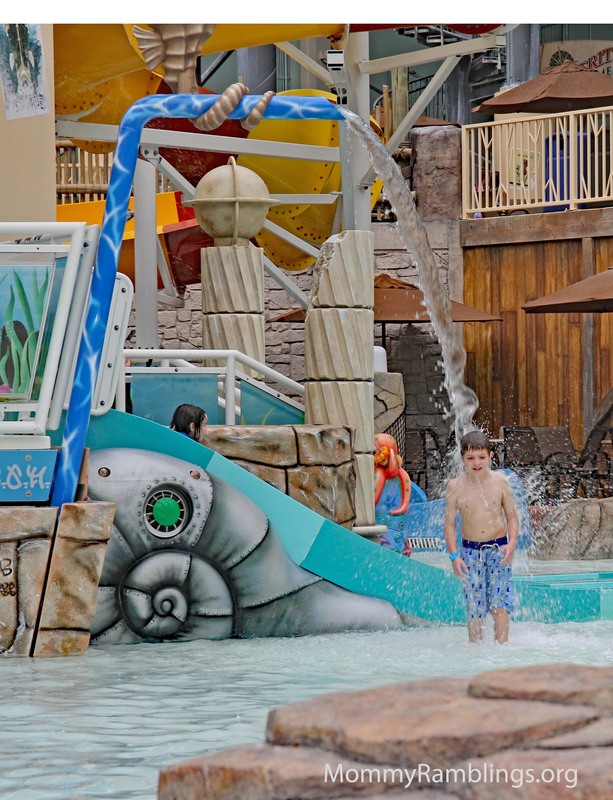 This resort features Aquatopia, the largest indoor waterpark in the Northeast that opened in 2015. The waterpark is awesome! There is a lot to do for kids of nearly every age. The lifeguards are very attentive and collisions in slides are avoided as they pay extremely close attention to make sure the first rider is out completely before allowing another rider down the slide. 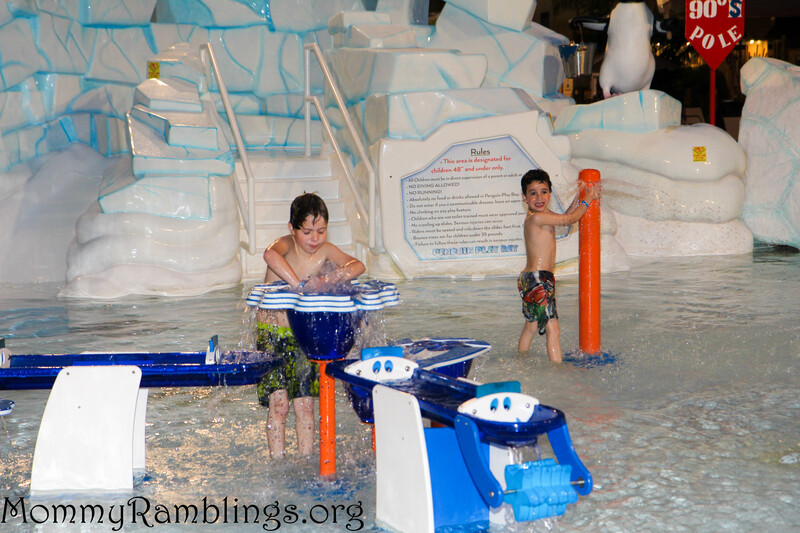 Penguin Play Bay is an area that even the youngest kids can enjoy! Multiple swings, small slides, water activities and of course some shallow water to splash and play in provide hours of tyke size enjoyment. 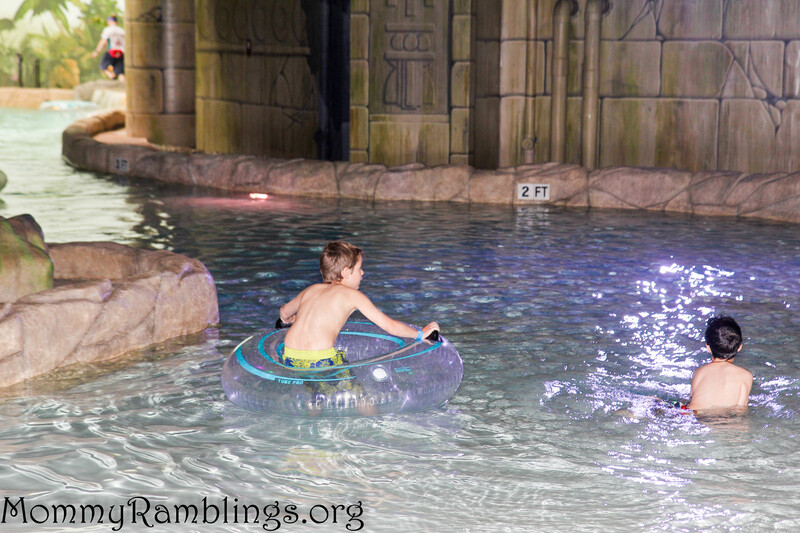 Kartrite’s Quest is a large area that offers fun for kids 40″ and above. 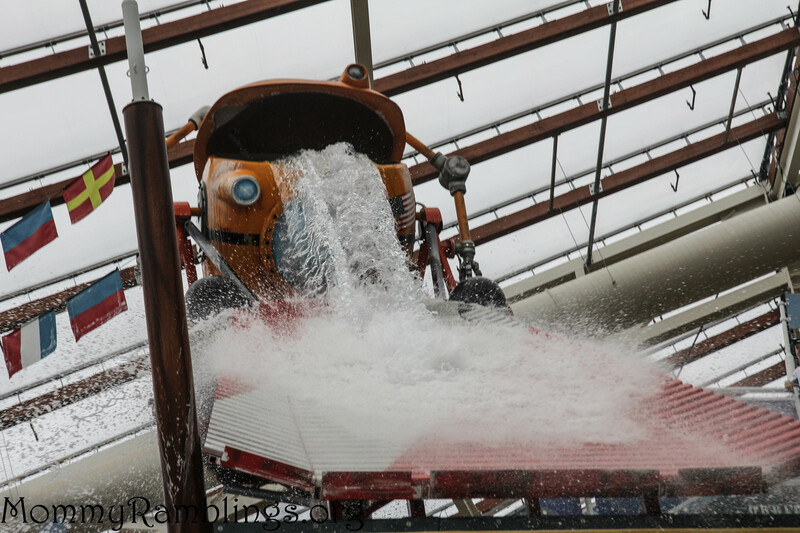 Prepare to be soaked as a large bucket on top dumps water on unsuspecting guests below. Kids have so much to do in Kartrite’s Quest! They can splash, slide, play basketball, test their coordination and so much more! There are many slides throughout this area that vary in size from pint size to ultra grande! 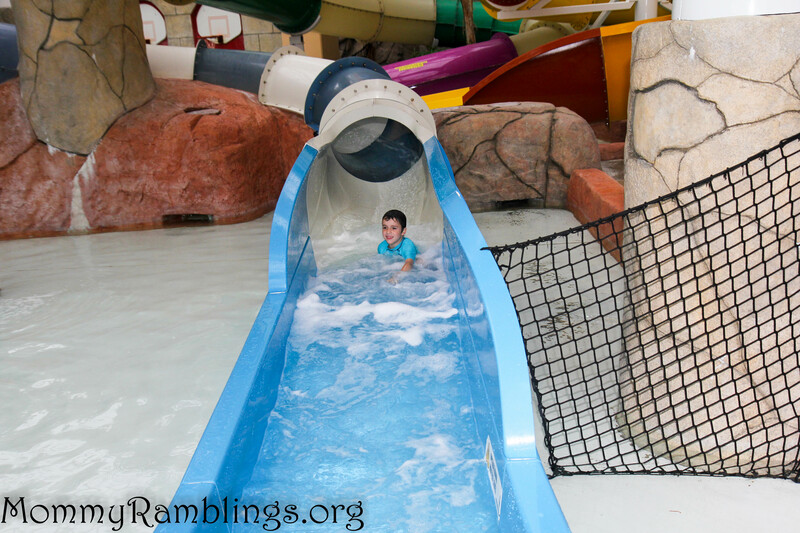 Small open and tube slides are great for kids to start out on. When they have their slide groove totally on, they can go up the stairs and ride any or all of the 3 large slides atop the quest! 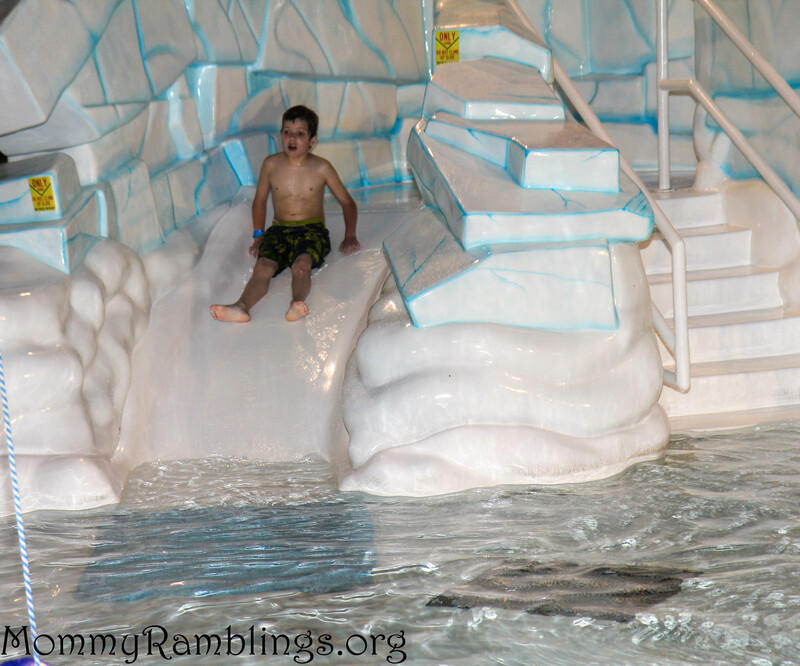 Out ‘N Back Trek & Silkroad Runner Slide are 2 of the larger slides for kids and adults alike. Then there is the Lava Luge Bowl Slide that shoots riders out into a large bowl area. We rode all these slides and had a blast! 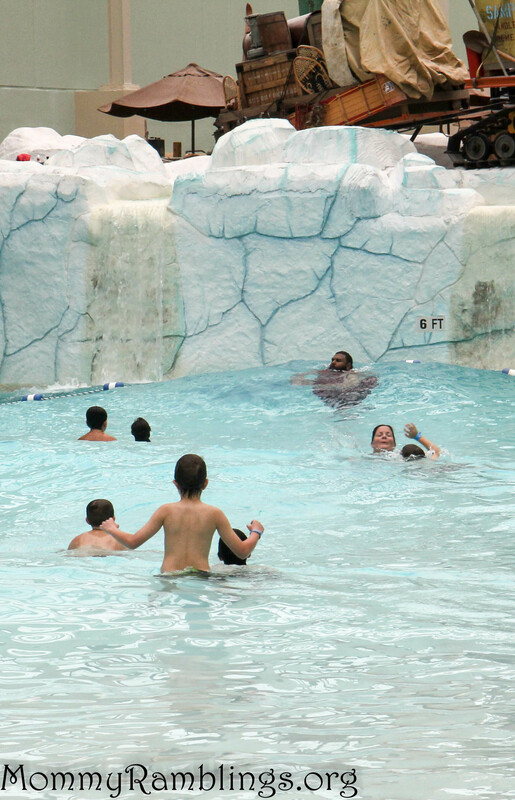 There is a pool area where the water is a max depth of 3’6″ and features the Ally-Oop Lagoon. The lagoon has several basketball hoops on the wall and multiple balls so everyone can try their hand at some water hoops. There is a large artificial tree in the center of this pool that separates the sections. Off to the other side is the Croc-O-Nile Crossing. A series of floating platforms along with an overhead climbing type rope ladder that kids can hold onto as they make their way from platform to platform tests their coordination and navigation skills. If they do fall in they have to start over and cannot climb on a platform from the water. The Great Ka-Na-Gawa Wavepool is a large pool that turns into a wave pool intermittently with the sound of a loud fog horn. Children regardless of how well they swim need to wear a life vest if they are under 42″. 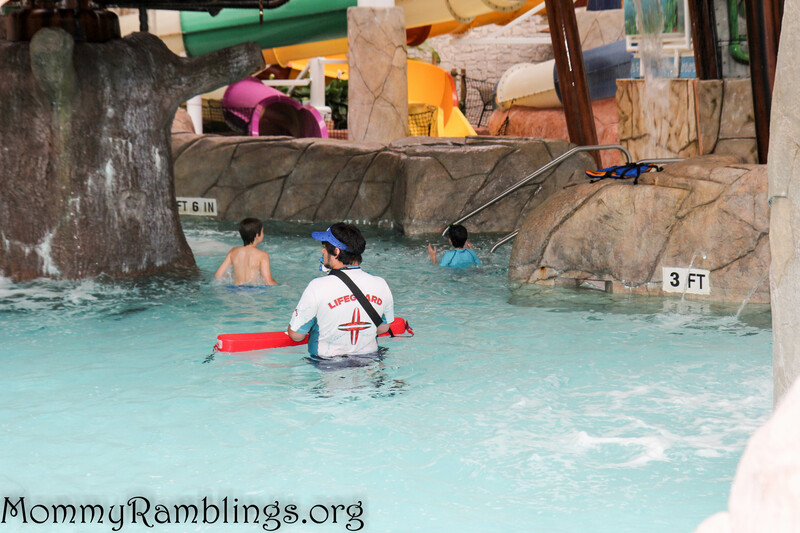 There are life vests available for all ages supplied by the lodge with a strict policy in place. 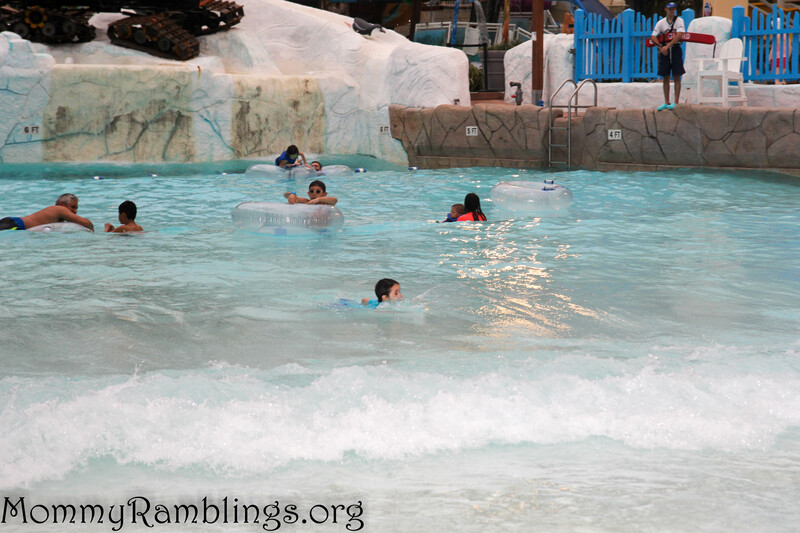 The waves are very fun and the wavepool was one of our family’s favorite things. We spent many hours in that pool. The lifeguards on duty at the wavepool are very attentive and constantly scanning the water for anyone in trouble. 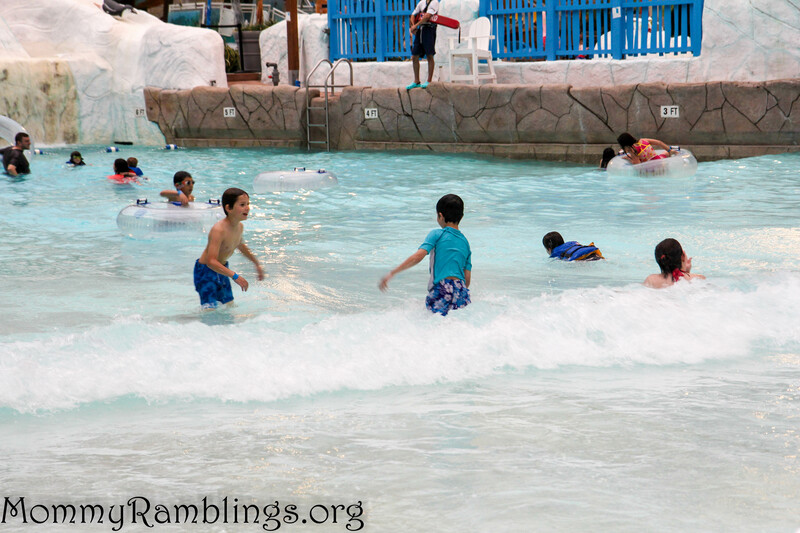 Our kids had a blast in that wave pool and never tired of it. 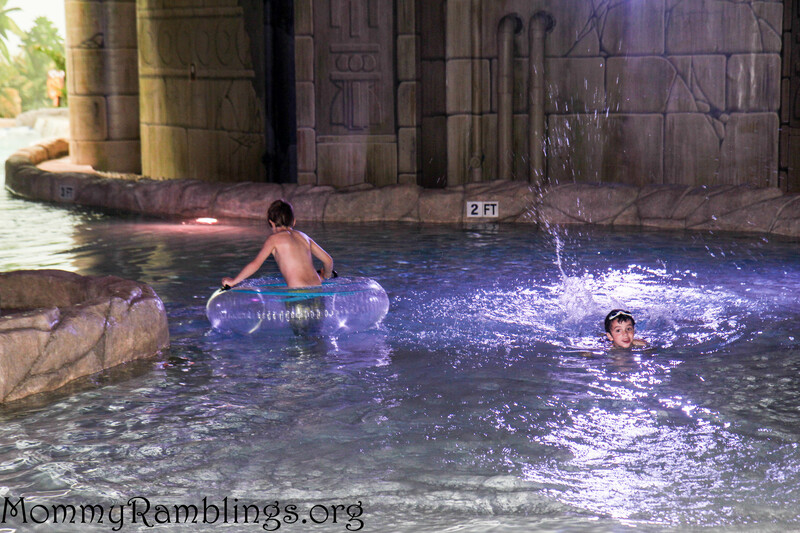 There are clear round tubes guests can use in the wavepool to sit in or hold onto. 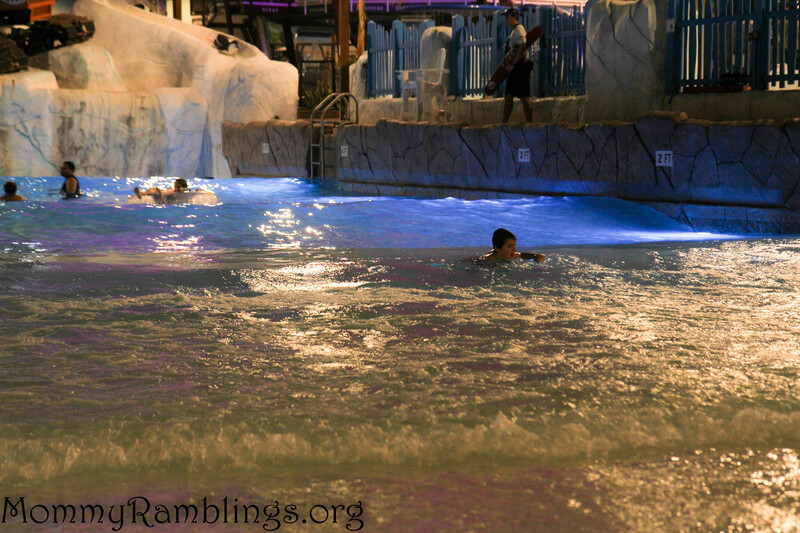 Guests are also able to just stand or free swim. The Lost River was another favorite spot. There is a current that guides you around in a single tube, double tube or you can free swim it. Cascading waterfalls at certain points will get you wet if you don’t navigate away from them. The Venus Slydetrap is a 608ft. raft ride for 3-6 people. This is what we considered a family ride but our little guys were hesitant to ride and so we had to skip this. It looked really fun and I was disappointed not to be able to try it. My husband and 9-year-old went on some of the free-falling slides-The Paradise Plunge and the Skydive Plummet that looked very intense. They had a blast but they were not for the faint of heart! 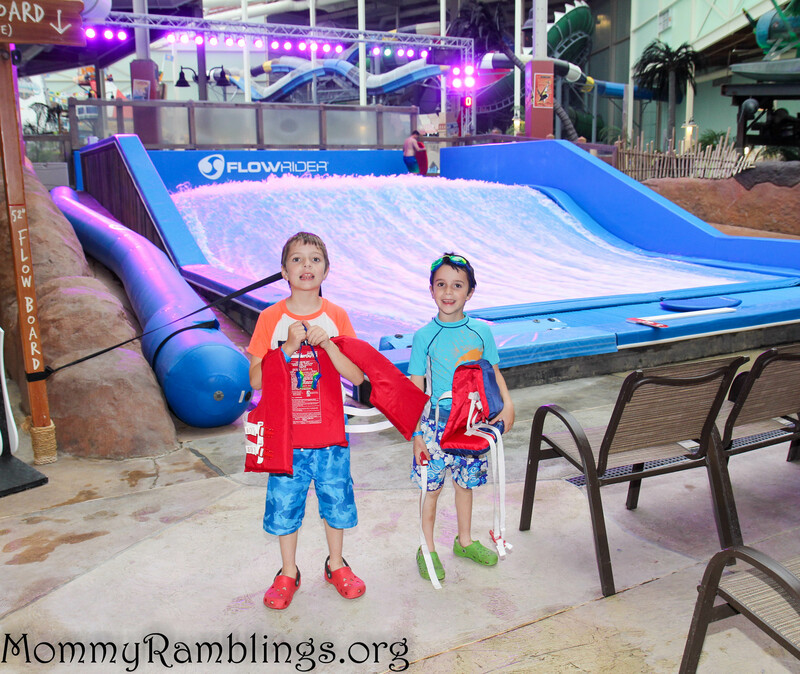 The Bombora Flowrider is an action packed surfing simulator. Guests can surf or Boogie Board and show off their amazing skills to the people who gather to watch. My husband gave some Boogie Boarding a try! There are lessons available in the morning and after closing. 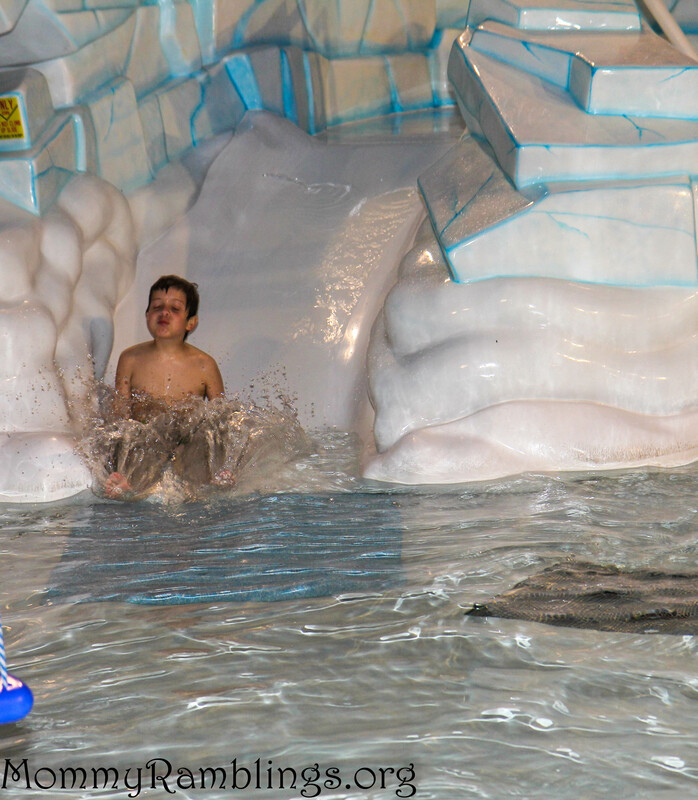 The waterpark is open until 9 pm. 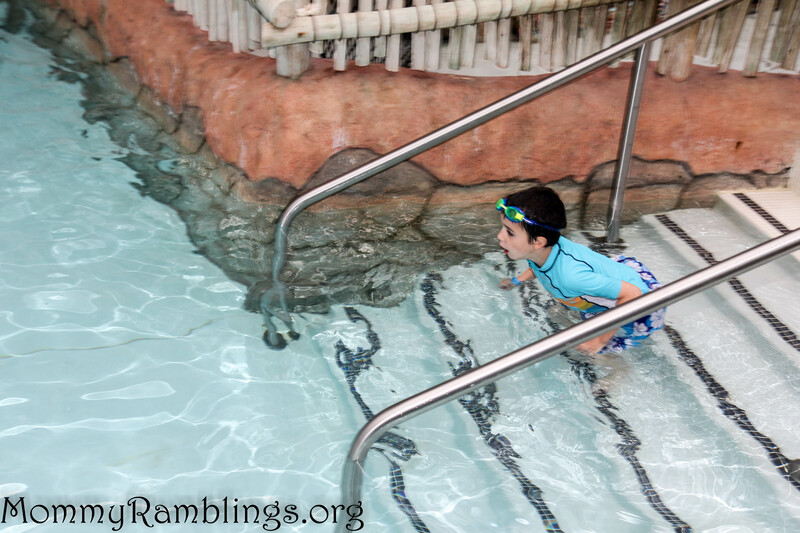 Mystic Springs is an indoor/outdoor warm spa lagoon with hydrotherapy jets. You can enter indoors and proceed to go into the outdoor section even in winter. The hot tub can be used by everyone and is not just 18 or older. This may or may not pose issues for you. There is also no lifeguard in the hot tube area and it is to be used at your own risk. 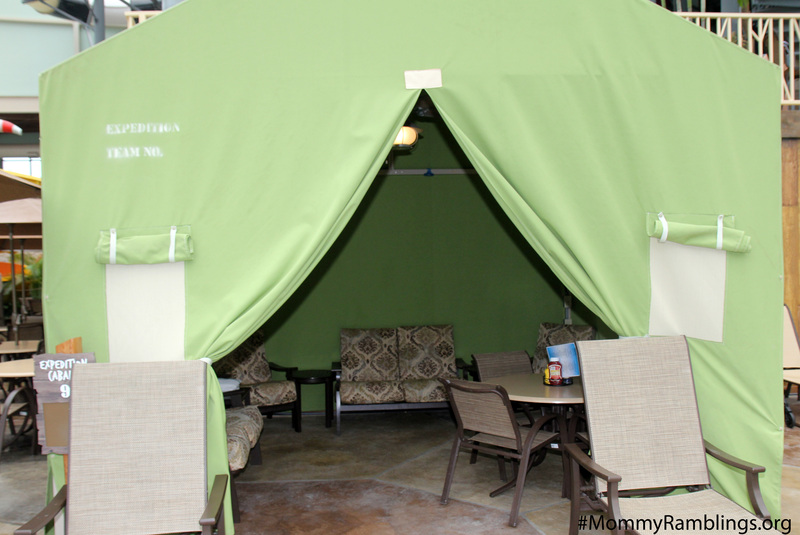 There are cabanas that you can rent if you so choose. Towels are provided. There are lockers and changing rooms. 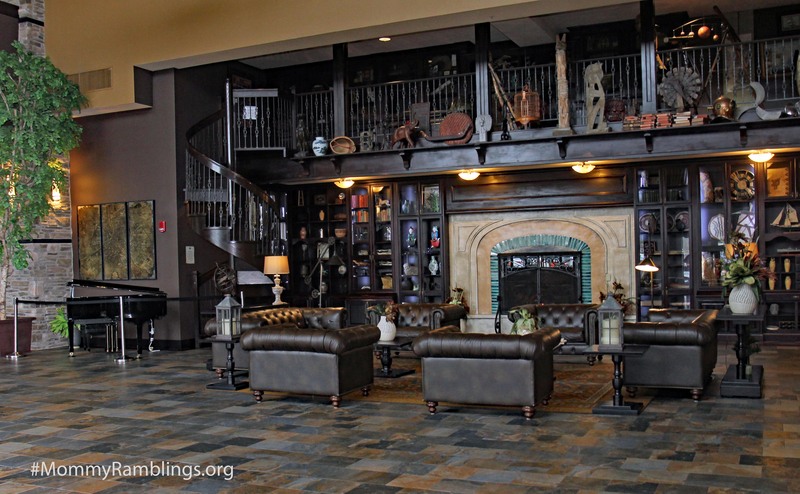 There are plenty of chairs, tables and lounge chairs around all of the attractions. There is food available, but it is the typical chicken fingers, mozzarella sticks, fries, pretzel type stuff. Absolutely no food or drinks are allowed in. GoPro and similar action cameras are not allowed to be used on the rides. It was not crowded when we went so there were no issues with that. I know from prior reviews they used to have the park open to the public and not just guests of the lodge. When it was open like that, there were reports of it being too crowded which I assume caused them to give the lodge guests exclusive access. When you exit the waterpark you walk straight into a large arcade and the air condition can be quite a shock. 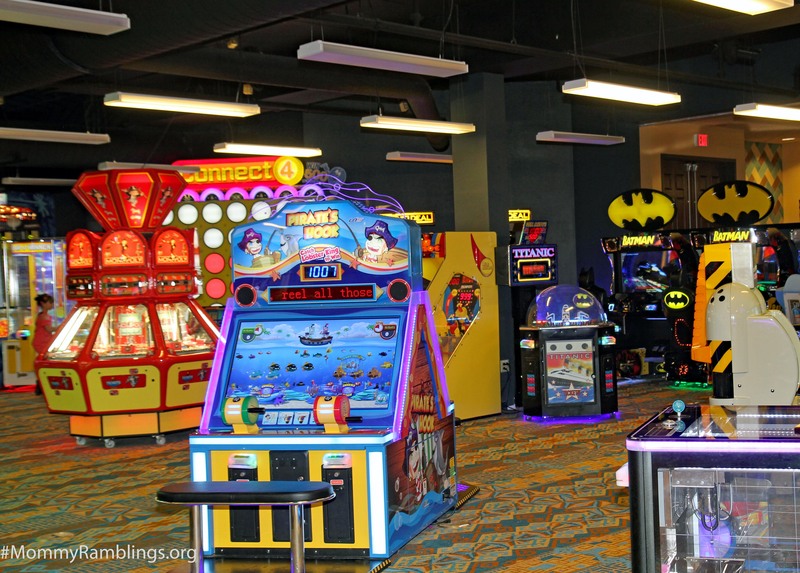 The arcade seemed to have a nice selection of games but our kids are more the kind that want to be the action so they did not play any games. We all kept busy and active in the waterpark during our stay. There are several types of rooms to choose from. Rooms with bunk beds and suites are available. The rooms are not well-lit and are very dark. 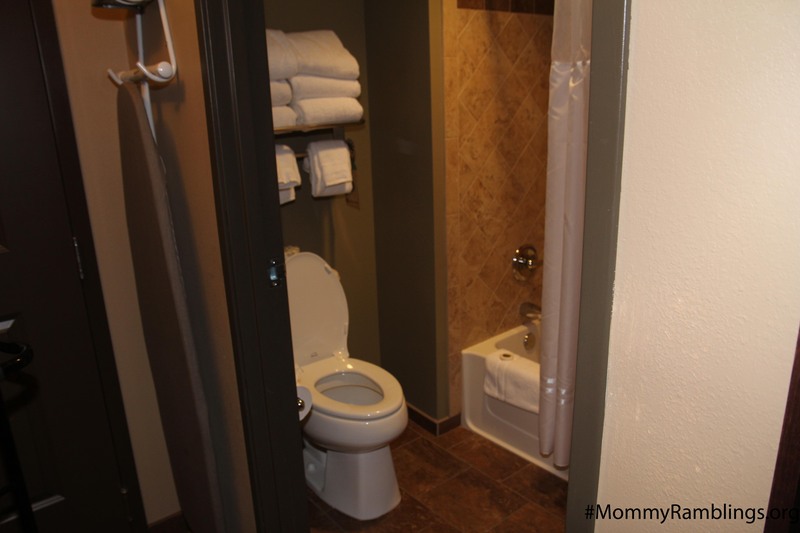 There is no sink in the bathroom but that is very common in these types of resorts. The bathroom is smaller and just has the toilet and tub/shower combo. We had a room with 2 queen size beds and a sofa that also opened to a bed. There was no turn down service offered. The wi-fi is can be spotty, depending on where your room is located. We had to change rooms as the first room we had did not have a wi-fi signal at all. Since I have to be able to log on and write, wi-fi was essential. When we changed rooms they put us near the front desk and we did have a good wi-fi connection. We went to dine off the premises. If you want to go out, there are several family and fast food restaurants off site as well as a Shop Rite and Walmart. 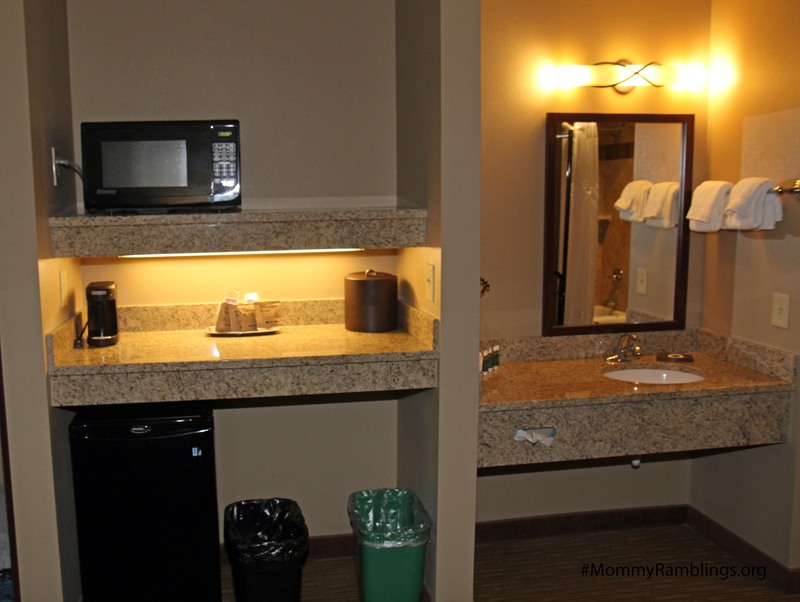 The rooms have a microwave and small refrigerator and small freezer. There are activities you can pay for outside the waterpark like ziplines and other action activities. We did run into guests who said they got good deals on a room, coupon book and breakfast vouchers on Groupon. If you are planning a trip check out specials. May has a special of buy one night at regular price and get one night at half off. 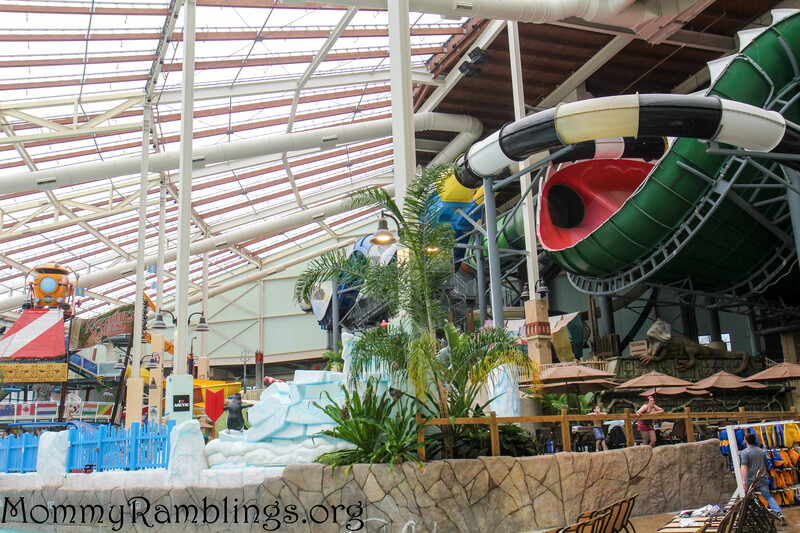 If you have been to Camelback Lodge please share your experience in the comments. If you have any questions for me, leave them in the comments too and I will answer to the best of my ability. 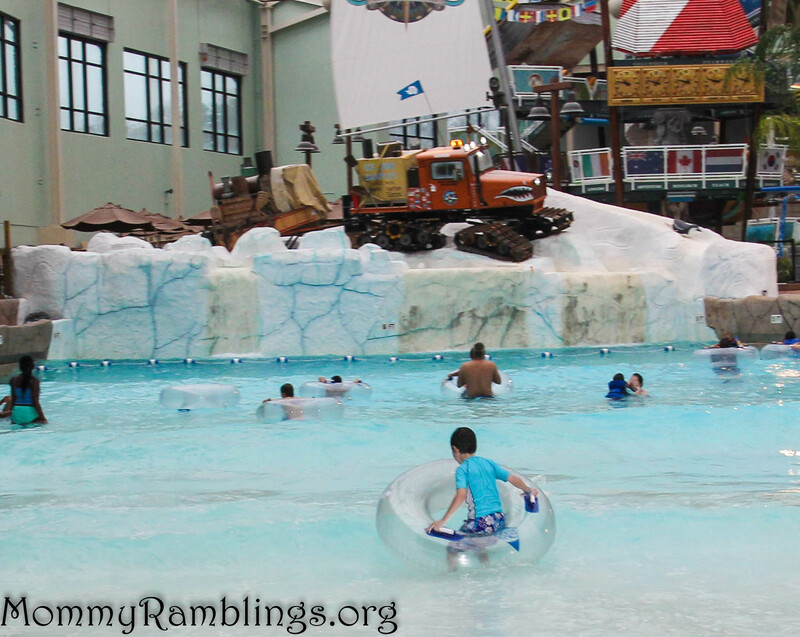 You can follow Camelback Lodge and Aquatopia on Facebook, Twitter, Instagram, Pinterest and YouTube. 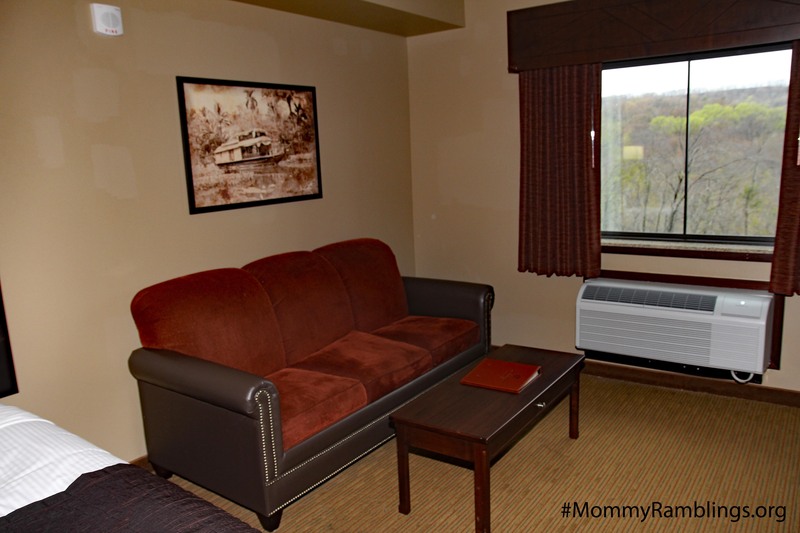 Keep following us as we bring you more great family friendly destinations in the Northeast. 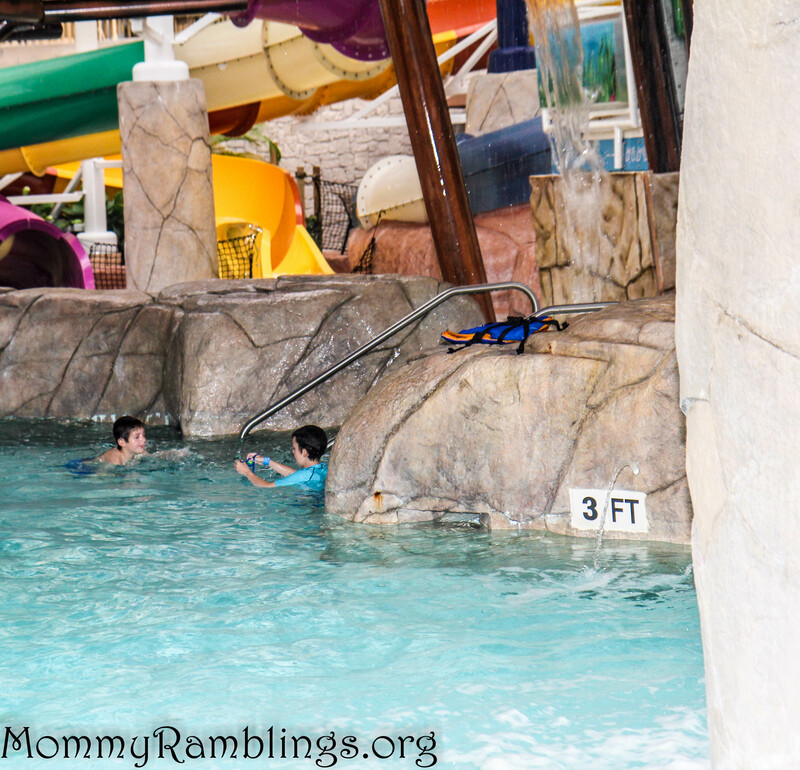 Our stay was sponsored by Camelback Resort, my views and words are as always 100% my own.